Ore Station Condo - Great Location - Great Rates! Just half block to skiing and downtown Telluride... This is a nicely furnished,newly remodeled, Non-Smoking condo with a great location. No car is needed. Nice views of mountains and ski gondola. This condo is available for three night minimum, weekly, or monthly.Master bedroom has king bed,second bedroom has two twin beds. Sleeper sofa is queen size. Great restaurants and plenty of activities for everyone. You won't find a better value with this location. Allison D.Where do you live? We have stayed at Ore Station several times. Always enjoy it’s location and convenience to town and mountain village. Fantastic condo in a fantastic location . . . 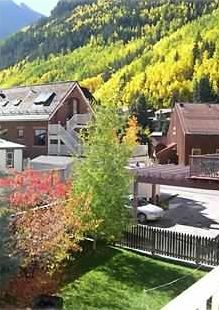 This is a great condo right in the thick of things in Telluride. Close to restaurants and the gondola. I recommend it highly. We stayed in January on a ski vacation. On a previous trip to Telluride we had stayed at the other end of town. We enjoyed this location much more and found it convenient to get to virtually everything on foot. The beds were comfortable, the Sonos sound system is awesome, there was plenty of room for all of us and our stuff, and the kitchen was equipped with everything we needed. The sauna in the master shower is a very nice touch and we enjoyed it thoroughly. Recommend highly. We had a great time in Telluride staying at this Ore Station condo. As skiers, the very short walk to the gondola was perfect. The location is also convenient to be able to walk to the restaurants and bars in town. The condo was comfortable, well laid out with a nice balcony and some views to the mountains. The owners are easily accessible and even had some good recommendations for places to rent skies. We hope to stay here again on our next Telluride trip. Fantastic location. Very convenient to Restaurants, shops, grocery and lift. Property owner was very friendly and helpful. Cozy and comfortable. Our family would love to return. The location of the condo was great. Comfortable beds and very nice bathrooms and kitchen. I asked Tony a bunch of questions before going to Telluride and he got back to me quickly and with advice. The condo was a perfect size for my family of four and three of the four are over 6 feet tall. We would stay again.